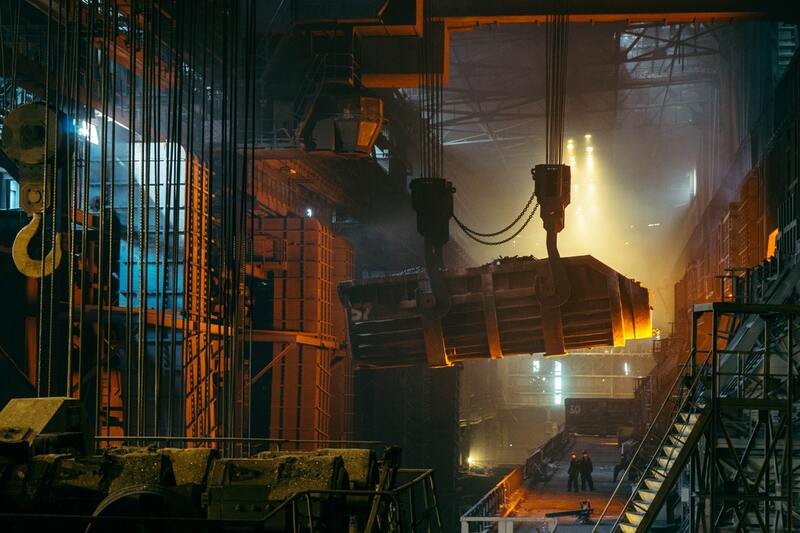 While historically companies have used imported aluminum to improve their bottom lines, with the implementation of tariffs on both the raw metal and fabricated products, manufacturers are exploring other strategies. Some, such as Coca-Cola and Genuine Parts, are expecting to pass their cost increases onto consumers. Others, like Illinois Tool Works, are pursuing local sourcing. With shorter distances involved when using domestic suppliers, the resultant costs of logistical problems regarding weather conditions and geopolitical obstacles can be reduced or eliminated. Transportation expenditures also are lower and fewer warehousing facilities may be required. Buying domestically can also result in increased goodwill from consumers. Many customers prefer locally produced goods. They consider buying them as promoting both local wealth and jobs. Recycled metal already is a significant source of the aluminum used in the United States. Of the 4.4 million metric tons of domestic aluminum production in 2017, 83 percent originated from recycled materials. This percentage could be even higher if exports of scrap to countries such as Turkey remained onshore. Using recycled aluminum diminishes both energy costs and environmental impact. One company that makes substantial use of recycling is Novelis, a producer of flat-rolled aluminum. It runs 11 recycling operations to supply its production needs. According to statistics gathered by IndustryNet, there are 940 aluminum companies in the United States. They encompass the aluminum extrusion; aluminum die castings, aluminum sheet, plate and foil; and aluminum foundry sectors. Aluminum companies provide 65,066 jobs. Average yearly sales for the industry are $47.8 billion. Aluminum extrusions are essential to many industries such as automotive, construction, and power generation. The extrusion process is low cost and features flexible tooling. These characteristics enable manufacturers to use extruded products to facilitate rapid design and prototyping. The lightweight of aluminum extrusions makes them a compelling choice for fuel-efficient vehicles. Extrusions find use in automobile and truck tailgate frames, engine mounts, running boards and roof consoles. Aluminum also resists corrosion more than most steel. Due to their flexibility, aluminum components are more resilient in a crash. • Family owned, Minnesota based Crown Extrusions Inc. has fabricated customized products for its customer base since 1968. It specializes in difficult profiles, tight tolerances and critical finishes. • General Aluminum Extrusions Inc. (GEI) is an ISO 9001 certified extruder, fabricator and finisher in Youngstown, Ohio. It utilizes lean manufacturing techniques to produce both custom and standard extrusions. The company provides an array of services including CNC machining, assembly, anodizing and painting in a 200,000 square foot facility. GEI serves markets that include automotive, transportation, consumer durables, metal service, electronics, appliances and medical equipment. Die casting produces more castings than any other process. The aluminum die casting technique forces aluminum into a mold under pressure. Two hardened and machined steel dies are used to create a cavity in the mold, which contains the aluminum. 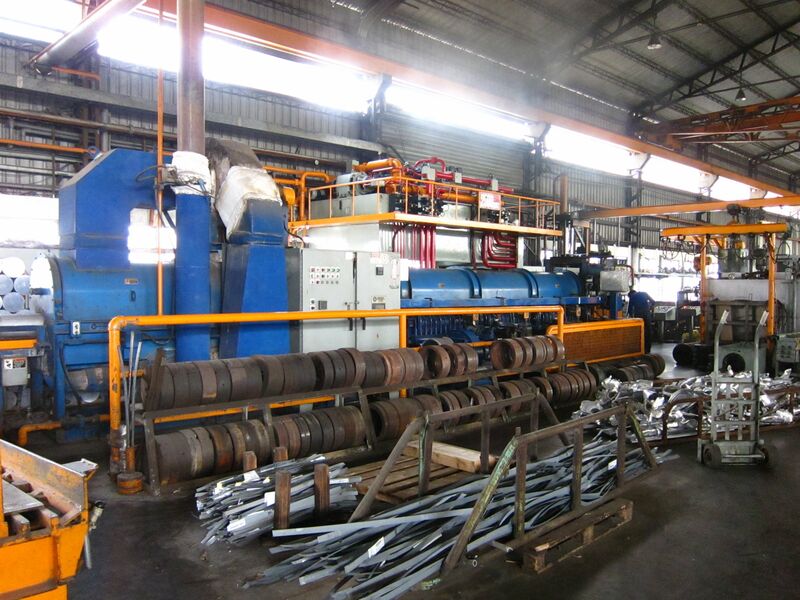 Purchasing casting equipment and producing dies requires a substantial capital investment. For this reason, die casting is generally limited to high volume production. Die castings produce a good surface finish and the dimensions of the components fabricated are consistent even for complex shapes. Aluminum castings retain their strength at high temperatures and exhibit excellent electrical and thermal conductivity. There are two types of die casting: hot and cold chamber. Aluminum casting uses only the cold chamber method. The process starts with melting the metal in a separate furnace. A precisely controlled amount of metal is delivered to an unheated shot chamber. A piston drives the shot into a die. An ejector die releases the cast part from the system. For dies to function, they must have thermal shock resistance and soften at elevated temperatures. • Thin walls are achievable. • Fewer finishing and machining operations required. • Parts produced have a high tensile strength. • Rheocast Company in Germantown, Wisconsin, has offered high-pressure aluminum castings since 1977. They produce parts that weigh from a few ounces to 10 pounds. Applications for Rheocast products include fluid meter and lighting fixture components and decorative hardware. The company provides full service, from engineering through casting, machining, finishing and assembly. Its quality system is ISO 9001:2008 certified. • Callen Manufacturing Corp. in Northlake, Illinois, has been die casting aluminum since 1948. It produces geometrically complex castings for industrial markets from automotive to telecommunications. The company uses vacuum aided casting and electronic process monitoring to create components that have not only thin walls but low porosity. The parts it fabricates range in weight from several ounces to 35 pounds. Click here to see learn more about the numerous companies supplying aluminum die castings on IndustryNet, as well as aluminum gravity die castings as well as zinc, magnesium and brass die castings. Rolling is a metalworking process in which a metal feedstock passes through rollers one or more times until it achieves the desired thickness. If the temperature during rolling is above the recrystallization temperature of the metal, the process is designated as "hot rolling." If the temperature is lower, the procedure is called "cold rolling." Rolled aluminum products play an essential role in the lives of most Americans. 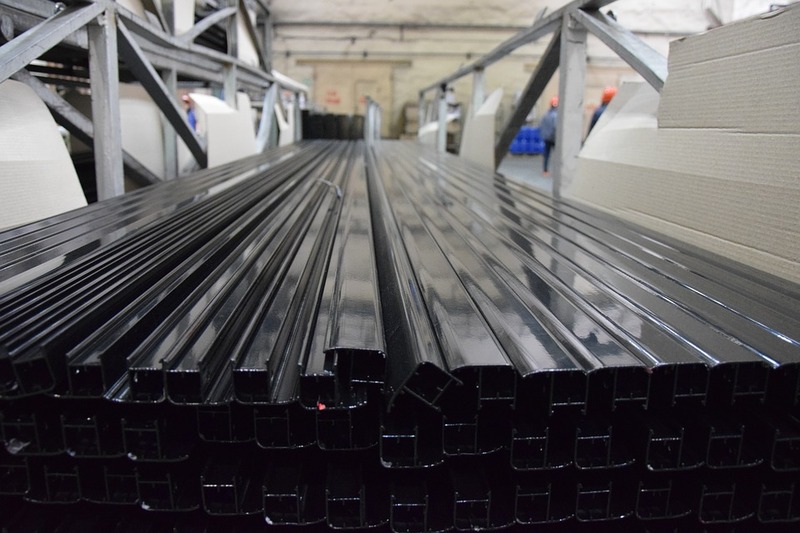 Thicker rolled products form the structure for aircraft and rail cars. 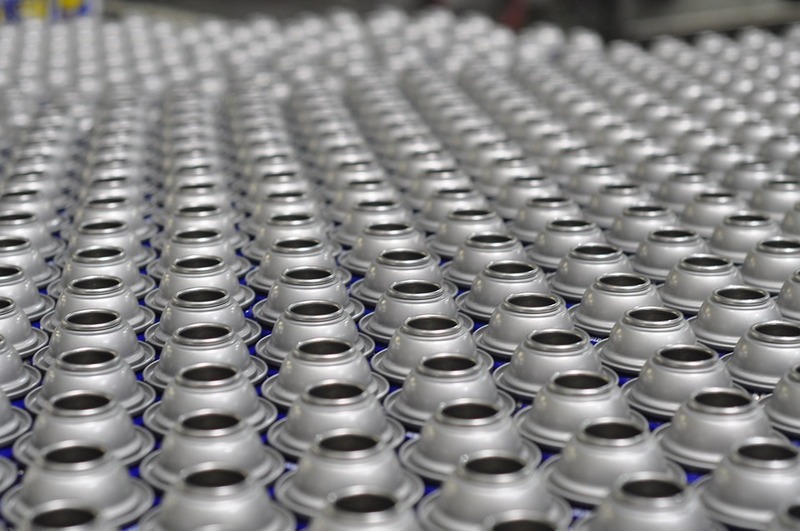 Thinner products are vital to the packaging industry for use in beverage cans and as foil. Packaging consumes almost 50 percent of all aluminum alloys in North America. As car manufacturers strive toward lighter, more fuel-efficient vehicles, more rolled aluminum is expected to be utilized by the automotive industry. Fabricators stretch drawn aluminum into desired thicknesses and shapes. Drawing is usually a room temperature process, but the production of large rods, wires and hollow configurations may require heat. Sheet metal may be drawn as a part of shaping which may also include other forming techniques such as piercing. Bars, tubes and wires are all drawn through dies to produce the required configurations. The use of aluminum wire in the utilities and building markets has grown 20 percent over the past decade. One pound of aluminum can equal the current-carrying capacity of 2 pounds of copper. Aluminum has been used in electrical applications in the U.S. both safely and effectively for over 100 years. The ability of aluminum wire to be bent back and forth repeatedly is greater than that of copper wire which can carry the same amount of electricity. Bending aluminum wire also requires less force. Once aluminum wire is bent, it is more likely to keep the intended shape than copper wire. In most cases, AA-8000 aluminum alloy building wire is used to comply with applicable regulations. • Constellium Rolled Products Ravenswood LLC in Ravenswood, West Virginia, is the largest employer in Jackson County, with over 1,100 workers. The company built the Ravenswood plant in 1957. It covers 62 acres and is home to the world's largest cold rolling mill. The facility produces products for the defense, transportation, aerospace and marine industries. • The Aleris Richmond Rolling Mill in Richmond, Virginia, produces aluminum rolled sheet for the building and construction industries. Its products are employed to manufacture gutters, downspouts and siding. The plant was established in 1959. It uses recycled material in its manufacturing process. Click here to see a full list of aluminum rolling and drawing suppliers on IndustryNet, including those specializing in aluminum coil; aluminum billets; aluminum ignots; and aluminum products. The thickness of rolled aluminum determines whether it is plate, sheet or foil. The thickness of sheet aluminum must be under 0.25 inches and at least 0.008 inches. Foil is thinner than sheet, and plate is thicker. Aluminum ingots, which can weigh more than 20 tons, are rolled into plate. Sheet requires additional rolling, and foil even more. Aluminum plate finds use in the aerospace, military and transportation sectors. It is machined into shapes that form the skins of jets and fuel tanks for spacecraft. Many industries also use aluminum plate for tanks designed for cold storage because it gains strength at very low temperatures. Plate is used both in the manufacture of vehicles and as armor capable of deflecting a 50 caliber round. Related: Who makes it: 11 leading sheet aluminum companies in the U.S.
Packaging uses both sheet and foil aluminum. Sheet is also used to make panels for cars and tractor trailers, and in appliances, construction and cookware. When anodized, sheet can be dyed hundreds of colors including red, gold and black. • Metals USA in Liberty, Missouri, processes finished and unfinished products to customers' specifications. They offer both plate and sheet. The company maintains service centers across the country. • United Performance Metals in Hamilton, Ohio, serves industries including aerospace, medical, semiconductors, oil and gas, and power generation. The company was established as Aerospace Alloys in 1982. It is now part of one of the largest family-owned groups of metal service centers in the United States. Click here to see a full list of aluminum suppliers including those specializing in aluminum foil, aluminum plate and aluminum fabricating. 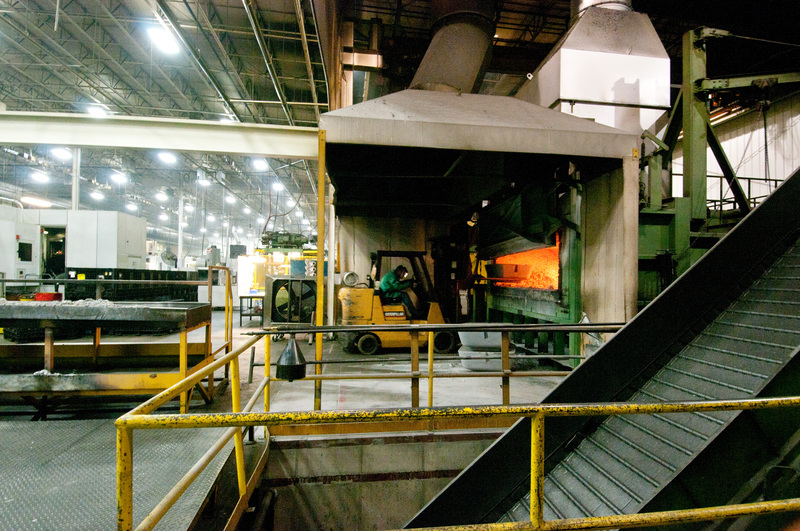 Foundries produce metal castings by melting metal in furnaces and pouring it into molds. The material introduced into a furnace may be pure forms of previously unused metal, or scrap and alloying metals. Additional processing refines away gases and contaminants. Foundry furnaces come in all sizes and may weigh several tons. Aluminum foundry furnaces are designed with that specific metal in mind and use either electric resistance, gas heated crucibles, or are reverberatory. Foundries often use sand molding, which is versatile and simplifies the process of removing a finished product from a mold. Sand can be shaken or tumbled away. Sand molds are formed by using a pattern that is a replica of the part to be produced. The model is pressed into a fine sand mixture to form a mold. Sand casting is relatively slow but is economical for smaller runs and a practical method to form large parts such as the bed of a rail car. • Superior Aluminum Castings Inc. in Independence, Missouri, has been in business for 70 years. In addition to pouring and casting aluminum, the company offers laboratory and finishing services. It utilizes computer-aided production control and just in time (JIT) manufacturing. • Koko's Foundry Inc. in Los Angeles, California, has been in operation for 37 years. The company both designs and casts items by a variety of molding methods. It offers finishing options that include plating and polishing. Koko's products include faucets, lighting fixtures and accent pieces for home décor. Ready to start your search? IndustryNet maintains updated data on over 420,000 manufacturers and suppliers. You can narrow your search and develop a list of aluminum suppliers by the type of product or service you require. The guide also lists companies by location and certifications. Utilizing a free online search, you can readily request quotes and contact vendors directly or through social media.